To play properly, a musical instrument must be properly tuned. Tuning a guitar or ukulele is simple. First off you need a guitar tuner, without which your work will be considerably more difficult. There are no differences between tuners with regard to the particular instrument they are used for. You can use a guitar tuner to tune acoustic and electric guitars, bass guitars and ukuleles. There are three basic types of tuners: classic,clipandpedal. Classic guitar tuners are suitable for acoustic and electric guitars, bass guitars and ukuleles . Classic tuners are equipped with a microphone that picks up the sound of the acoustic instrument and analyses it. These tuners usually also have a jack input for connecting electric guitars and bass guitars with a cable. 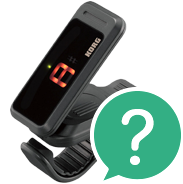 All classic tuners are equipped with a simple screen that shows the tuning of the string. The main advantage of clip tuners is their compact size. Clip it to the head of the instrument, where you can even leave it as you play. When tuning your electric guitar or bass guitar, you needn't unplug your instrument – the clip tuner picks upthe instrument's vibrations, so you needn't connect a cable to the tuner. Clip guitar tuners are extremely practical and highly versatile. This type of guitar tuner is designed mainly for electric guitars and bass guitars. The size of these tuners is roughly the same as pedal effects, and players install them along with their pedals. As such, there's no need to disconnect anything during a concert, simply press the switch on the tuner to turn it on, tune your guitar, and get on with the show. Pedal tuners are typically equipped with an illuminated or LED display so the tuning state is easily visible in a dark club or, conversely, in the bright sunshine of a festival. Switch on the tuner. Attach the clip tuner to the head of the guitar, place the classic tuner near the guitar, or in the case of an electric guitar, attach the instrument to the tuner with an instrument cable. When tuning your electric guitar, don't forget to turn the volume control to the right to produce a signal from the guitar. Pluck the upper (thickest) E string. If the little hand of the tuner is in the left half of the display, tighten the string to increase its tension and hence its tone. Turn the tuning peg to tighten the string. If, on the other hand, the little hand is in the right part of the display, the sting must be loosen to lower the tone. The string is tuned once the little hand point straight up, i.e. it isn't leaning towards one side or the other. New strings require frequent tuning, and it takes a while before they break in. You can help this process along by tightening the strings twice while tuning them. The standard tuning of the guitar from the thickest string to the thinnest is E, A, D, G, B, E. Bass guitars are tuned to E, A, D, G, ukuleles to G, C, E, A.
Guitars in particular have many alternative tunings, including drop, open and others. These are used by more advanced guitarists, since they require a specific style, playing technique, etc. May you tune and play perfectly!